This isn't a cooking blog but the occasional recipe makes its way here. As my Facebook friends will tell you, I love to cook and I love to feed people. My Facebook posts seem to rotate between bike rides and cooking (What can I say? Biking makes me hungry!) with a side of public policy and reminders to vote. Hey, that sounds like this blog. To inspire your own foodie updates, here's a round-up of recipes I've posted here, along with notes on a few of my favorite cookbooks and other posts on food in general. As for cookbooks, I have a full bookcase in my kitchen. I like to read cookbooks and taste the recipes in my head--many a calorie-free meal is enjoyed this way. I most often use recipes as a starting point for inspiration and then improvise based on ingredients on hand unless it's one of those recipes where chemistry and proportions seem to really matter. I appreciate cookbook writers who think the way I do and throw in parenthetical remarks like "using rosemary instead of basil takes this in a whole new direction." Madhur Jaffrey's World Vegetarian. She's on Twitter now! Follow @madhursworld. The Spanish Egg and Potato Cake is a new family favorite and reading the book is like a trip around the world's great kitchens. The New Laurel's Kitchen. Mostly for bread but I'll be trying her ketchup recipe soon. 3 Bowls: Vegetarian Recipes from an American Zen Buddhist Monastery. Try the Herbed Sesame Polenta with Roasted Vegetables, Brown Rice with Quinoa, and Quinoa-Mushroom Nut Loaf. The Brilliant Bean. Family favorites: Lemony Garbanzo Bean Cake, Chocolate Midnight Bean Torte. Everyday Italian. Sweet Husband's favorite. He's adapted several recipes for my vegetarian palate including the Farfalle with "Turkey Susage" (Peppered Tofurkey lunchmeat works just fine), Peas and Mushrooms; the Wild Mushroom Risotto with Peas is incredible because he uses the full amount of butter specified whereas I'd cut it back so I just pretend not to know when I eat his; the Marinara Sauce is peppery and wonderful; and the Cantaloupe, Strawberries and Grapes with White Wine and Mint makes a wonderful light summer dessert. The Art of Low-Calorie Cooking. "Art" is right: Beautiful food photography of gourmet food prepared with no sacrifice of flavor; source of the Crackling Cornbread recipe linked above. Try the Giambotta--a delicious kettle full of veggies--and the Winter Squash and Gruyere Gratin--rich and creamy goodness. Almost Vegetarian. I turn to this one occasionally. Great Good Food. Nicely organized by season; I use the pie crust recipe from this one. The Athlete's Palate Cookbook. The latest bookcase addition; so far I've only made the Asparagus Omelet Tart in a Dill Polenta Crust--needs a little more zing in the polenta crust but it was delicious. Jane Brody's Good Food Book. An old standby; my copy falls open to the Oatmeal Muffins on page 601 (we'll just pretend the recipe name doesn't include those nasty raisins--I leave them out). A bookcase full of cookbooks accumulated over the years demonstrates how nutrition trends come and go--I didn't realize until I looked this up on Amazon to link that the subtitle refers to "the high-carbohydrate way." Pre-Atkins, obviously, and perfect for a household with a metabolic burner like my bike-racing Sweet Husband since he needs lots of carbs. Another standby--the one my mother raised six kids with--Joy of Cooking. I have an edition I got in 1986 that lists 1975 as the last copyright date; I've heard less than flattering remarks about more recent editions. This is still the go-to for basic recipes like Fresh Cherry Pie. Joy of Cooking Christmas Cookies. I had to pick this one up because the main Joy of Cooking doesn't include some of the standards my family counts on like the Candy Cane Cookies with crushed peppermint. The other day Second Daughter asked me what I'd be thinking about on my deathbed: more about myself, perhaps reflecting back on my life, or more about others, telling them things I meant to tell them before. I thought a bit, threw in a few criteria for variables (am I alone or do I have visitors? Going fast or going slowly? ), and decided I'd probably be sharing things I meant to tell them sooner, maybe some things I'd learned because I want to spare them my hard lessons. As if having two daughters didn't tax my unsolicited-advice-giving reflexes enough, I blog on the topic every so often. Postscript: Eldest Daughter wandered in while I was working on this post. She mentioned something about life or dying and I said I was writing a blog post about that. 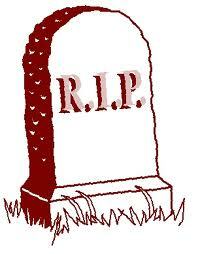 "You're writing a blog post in preparation for your death? How morbid!" The conversation took other turns, but then she looked over my shoulder as I uploaded the graphic. "You ARE writing a blog post about your death! Shouldn't you be updating your will instead?" Me: "Well, that isn't self-interest talking." Her: "What? I can't wear your shoes, we have different taste in furniture, I don't like your curtains, I don't want your money--what are you going to leave me?" I hate canned peaches. Hate ‘em. My whole family can tell you the story about when Barbie was trapped in a high-chair as a toddler and coerced into eating (home-) canned peaches with the “You can’t get down until you eat those, young lady!” approach. Spent hours, or so I hear, in that damn high chair. Mom finally relented and cut the requirement down to one small section, which I swallowed whole, tears streaming down my face (and hers, so rumor has it). 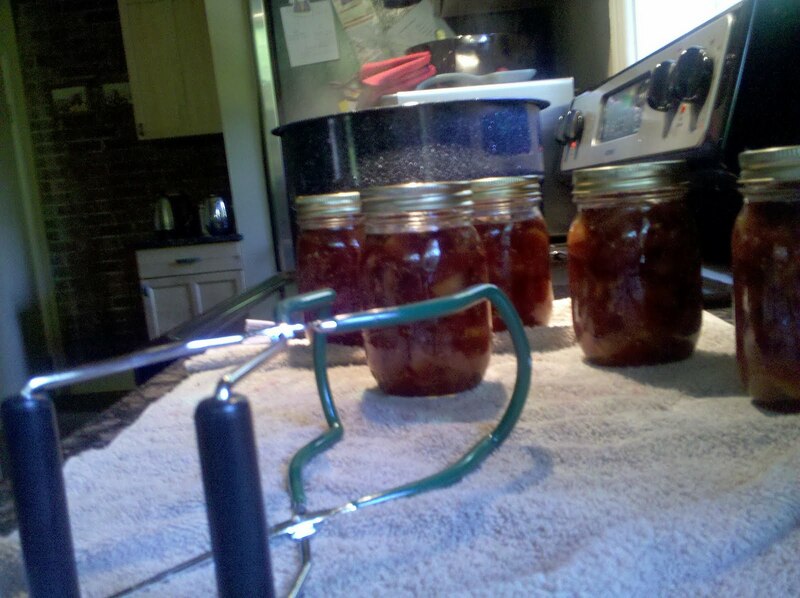 I was one stubborn baby and canned peaches in heavy syrup are slimy. Today, though, as a grown woman long past such traumas (eek! A can of peaches!) I enjoy fresh peaches straight from the farmers’ market. Not those hardballs shipped long distances while still underripe, mind you—they never get any riper and they’re a waste of chewing effort. But fresh, juice-dripping-down-your-arm peaches, maybe with a little whole cream on top if I’m really indulging? Yes, please and thank you kindly, ma’am. Last Saturday's haul from the farmers’ market included peaches. I had peach chutney in mind because I love tangy foods and with enough spices I can trick my mind into thinking of this as something other than (ugh!) canned peaches. You never know what new food will turn up at the market. Today it was elderberries. I’ve only thought of them in connection with jam and wine (and have never had either), but here they were: itty-bitty-teeny-tiny berries in little clusters similar to champagne grapes (adorable). I’m a sucker for cute food so some elderberries came home with me. Turns out those babies are tart. Mouth-puckering, in fact, and not something I’d throw in a bowl with the fresh blueberries I also got. But hey, chutney is supposed to be zingy and I’m making chutney, so let’s experiment! 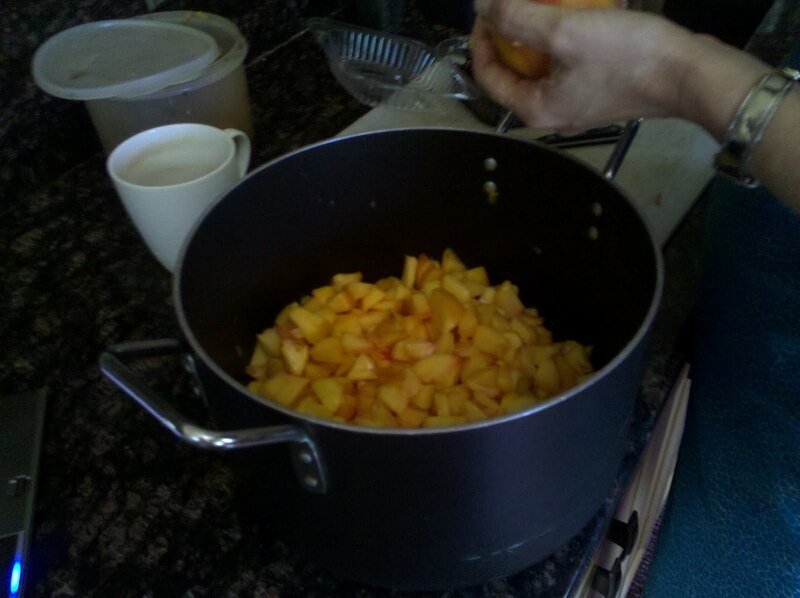 I had one fresh peach chutney recipe that sounded really, really simple but didn’t say anything about being safe for canning, and another recipe for a much larger quantity of peaches than I had. The latter also included raisins and as I believe I’ve mentioned before, I don’t much like raisins. So I created a mash-up, used the seasonings from the big recipe but cut them down to one-third since that seemed about right for the number of peaches I had, and let elderberries play stunt double for the raisins. I’m no canning expert so I rely on The Big Book of Preserving the Harvest and the Food in Jars blog to guide me. Both stress the importance of sufficient acidity in foods you want to can in a boiling-water bath the way I do in my very ordinary speckled canner (versus the much more expensive All-American 30-Quart Pressure Cooker/Canner I don’t yet own but which is clearly worthy of Title Capitalization Status). Peaches are on the high-acid fruit list and may be canned on their own with sugar; I figured that with the addition of vinegar I was safely on the high-acid side of the pH meter. I haven’t eaten the chutney itself yet but I tasted a little of the syrupy goodness left over in the bottom of the pot. This is going to be some good chutney. And it’s not canned peaches. ½ t. ginger paste (comes in a jar); could substitute minced fresh ginger in which case I might bump it up a bit to 1 t.
Get all the boiling-water canning stuff set up first so the water will be hot by the time you're ready for it. Sterilize jars, heat lids, etc. Set up a big kettle (non-reactive finish) and throw these ingredients in as you get them ready. 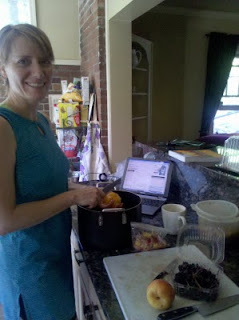 Working over the kettle with the peaches allows you to catch all the juices. Peel, pit and dice the peaches. Strip the itty-bitty-teeny-tiny elderberries from their stems and doublecheck so you don’t make Stem Chutney. Dice onions/shallots. Add sugar, spices and vinegar and stir it all together. Cook all this on the stove over medium heat approximately 30 minutes, stirring regularly, then follow the canning instructions for boiling-water bath processing. Process 20 minutes. As part of my ongoing plan to NOT turn into my mother when I get old—well, this is really only about certain aspects of turning into her since her voice already comes out of my mouth and I’ve been known to say “six of one, half a dozen of the other”—I try to apply the SISO method to purchases. Stuff In, Stuff Out, that is. This picture illustrates a bit of that. We’ve “invested” (ha!) in cheap dishware for far too long. It chips, it cracks, it breaks outright, and the dinner plates for the most recent set don’t even fit in the dishwasher, necessitating a lot of hand washing. I also bought a set of deliberately-even-cheaper plastic dishes for use on the patio--as if anyone would ever remember to use those instead of the breakable set. I’ve always liked Fiestaware and decided to start buying it as an investment in better quality and products made in the US. Not shopping for it like one of those people who tramples others in search of the matching serving bowl, mind you—just having fun poking around antique stores and picking up a plate or a bowl here and there. I figured this would take a while but we could put up with the cheap stuff (it disappears a little bit at a time anyway) as we built up a cupboard full of colorful fun. Last weekend I lucked into a batch that nearly makes up six full settings (thanks, Vintage Rabbit, for being such an awesome source!). Eldest Daughter helped me haul our stash out to the car. 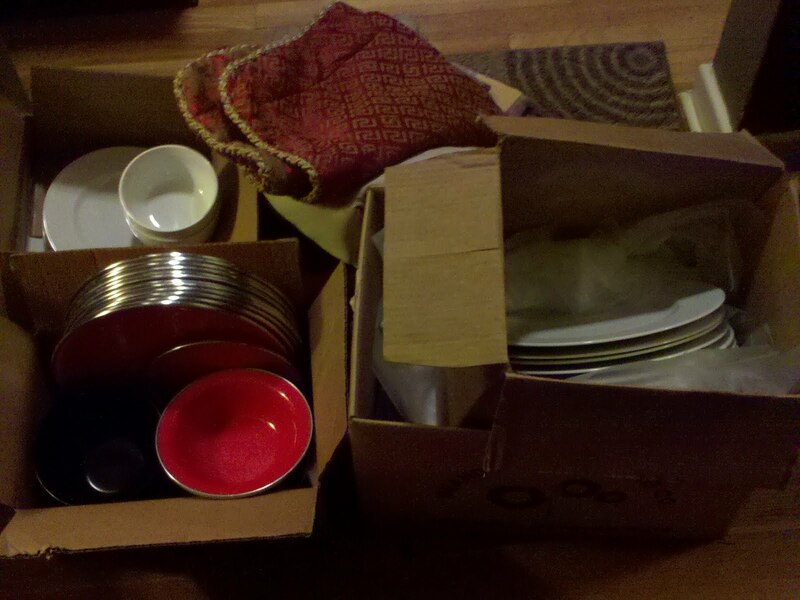 When we got it home I faced the test: Would I keep all those other dishes or make a clean sweep of it? Never mind that the last time I did a sit-down dinner for over a dozen people who would care about matching dishes I had a different husband and still ate meat (that was some prime rib I cooked, too—I still refer to that particular meal as The Day I Did The Full Martha). But no more. Instead I boxed them all up for Goodwill. I did stash the really giganto plates and the “gold” (plastic) chargers in the basement because I didn't score any giganto Fiestaware yet; if I haven’t used them in six months out they go. How is any of this being “not my mom”? It all goes back to the weekends I spent sorting through their house preparing for the estate sale before we moved them to assisted living for Mom’s dementia. I swore then to end my “just in case we’ll need it someday” approach to deciding what stays and what goes. A lifetime of that and they’ll be digging your corpse out from under a mound of empty yogurt containers and peanut butter jars, to say nothing of magazines saved because there was that one recipe you really meant to try one of these days when you had fresh cilantro on hand, or was it fennel bulb? At any rate, I’m trying to use the SISO method not just on housewares but on my closet, my bathroom, and other places where things tend to accumulate and then multiply in the dark. If my white sleeveless shell—one of those closet basics they tell you to invest in and They Are Right On This One—is getting ratty around the arms and I buy a replacement then I have to get rid of the first one. No keeping it for back-up. It’s ratty, remember? You replaced it, right? If I own two pairs of tan capris—one pair dressier than the other so yes there’s a reason I have two pair (pairs? )—then I resist the urge to buy a pair of tan capris with faint cream stripes (different, right? Not duplicative of the other two pair, right?) on sale for 50% off at Bobby’s Boutique which carries the best of the Goodwill best meaning I could have had those babies for $4 instead of $8 and even Eldest Daughter the Uber-Mom-That-Makes-You-Look-Old-Clothing-Critic thought they looked good on me breathe baby breathe it’s okay you don’t need them…. Don't Buy That Case of Stuff on Sale. 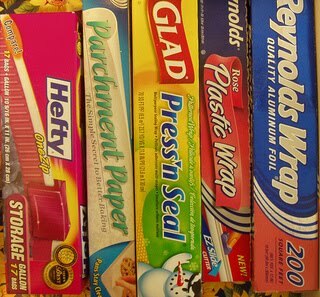 Nearly a decade has passed since I helped prepare my parents for a move to assisted living for Mom’s dementia, but whenever I enter into a frenzy of cleaning, sorting, down-sizing or right-sizing I’m taken back to these days. They owned so much STUFF! I had no idea until I saw it all spread out in heaps and mounds all over the pool table, end tables, coffee table, folding tables, and every other flat surface in their basement. When I’d visit and she’d tell me she was “busy sorting” I had no idea what this meant. The topic wasn’t much of a conversation-starter so we’d move on. Once I went downstairs to look for myself, though, it appeared that each and every day of the week she started the task anew based on a different sorting algorithm. All of these without reference to the previous day’s system or any apparent progress, so of course she would never finish sorting. I took the girls with me sometimes to keep me company while I combed through closets, drawers, the three-car garage, and the dusty piles in the basement for anything actually worth keeping. I had ONE method: if it pertained to one of their six children, it went in a box with that kid’s name, and if it was something personal about Mom and Dad such as a scrapbook or photos it went into the box that would move with them. Other than that, Helloooo, Estate Sale Lady. 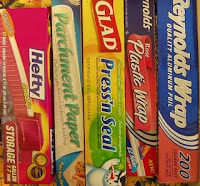 We found amazing quantities of some items. I only recently—and I’m serious about this—used the last of the plastic wrap I took with me. The girls took a lot away from this. 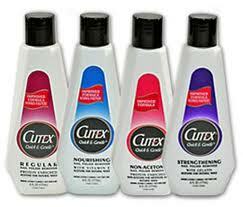 Things like finding six unopened bottles of nail polish remover in the bathroom cupboard stick with you, I guess. When we moved into this house about three years ago I wastefully—wastefully!—threw away multiple partial bottles of various skin lotions that promised oh so many magical things, all because one of the girls was there and spotted all the containers as I packed up my bathroom. I also have to watch my grocery-buying, although that’s getting easier since I’m starting to put up more of my own food. I only have so much pantry space and there will always be another sale on pasta so I no longer buy six bags of bow-ties (we do love our bow-tie pasta). 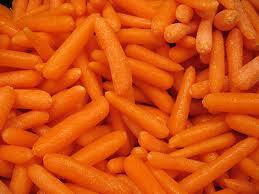 When I cleaned Mom’s fridge I found three bags of the fake baby carrots. Bag #1 in front was crisp and orange. Bag #2 right behind it was looking a little saggy. Bag #3 behind that had turned into green slime. Since she’d spent a big chunk of her life producing food in large quantities to feed her six children and their assorted friends and relations, her food-buying philosophy was firmly grounded in the notion that it never hurt to have a little extra on hand. As in, if they dropped the bomb you’d want to shelter in our basement, where you could live the next 40 years on a diet of canned tomatoes, string beans, and pickles. Couple this lifelong pantry-stocking with an inability to know that you’ve already bought something so you’re buying even more than you meant to…. …and you’ll understand why I make an extra effort to keep tabs on the condition of my bathroom closet and my produce drawer. And why my girls do, too.